Je n'aimerais pas faire leur travail. Making the best of it, Elisabeth. Nice title! They look to be clearing the carpet of leaves as well! It is a good thing to be happy in your work if you can.. Happy that it's just leaves today, Lisl?! I'm sure you were a happy diversion for them both. Lisl: Well, they seemed happy to stop work for half an hour or so, Ginnie! Très souriants ces Messieurs , c'est tant mieux ! Men at work, Lisl and I have to say "HAPPY" man at work. What a great picture this is. "Leaf us alone". They have "branched out" on other activities. 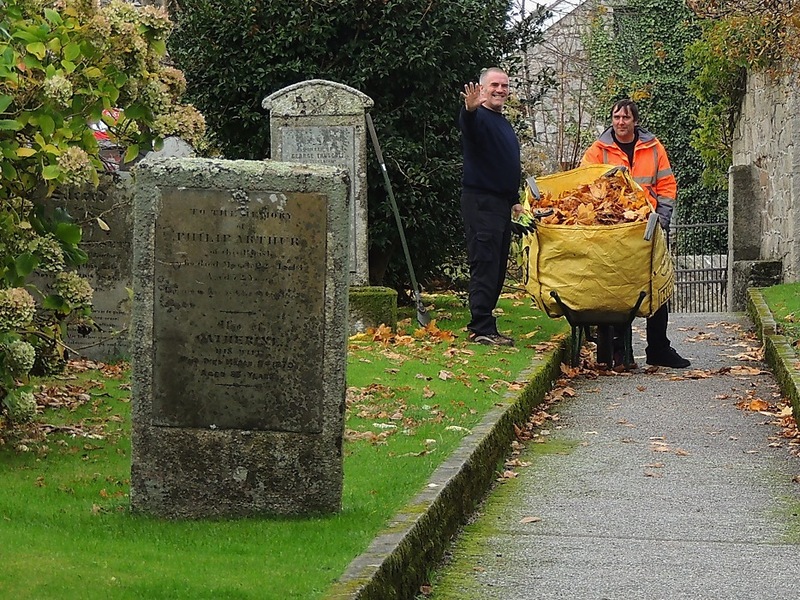 They look happy but leaf clearing can be a pain. They don't have machines in the UK? Great shot, not entirly happy about having his picture taken I guess. That's an ideal bag to have, Lisl. Looks like it holds a large quantity of leaves. Are you still allowed to burn leaves in England or, like we do here, put them out for collection? Lovely picture - the graveyard looks well kept.